Venice attraction-guides.com - Venice, Italy attractions guide Venice Piazza San Marco (St. Mark's Square) information about attractions, Procuratie Nuove, Procuratie Vecchie, Ala Napoleonica, history, pigeons, cafes, domes, Torre dell'Orologio clock tower, location and address, general tourist information about Piazza San Marco (St. Mark's Square) in Venice (Venezia) area, Italy (Italia) IT - Last updated 30/10/2012. The Piazza San Marco (St. Mark's Square), in central Venice, is a major attractions for tourists and visitors staying in Venice. Napoleon is famous for once remarking that Venice's Piazza San Marco was the 'finest drawing room in Europe'. The Piazza San Marco (St. Mark's Square) has been a popular tourist attraction for centuries and is also home a large number of friendly pigeons. 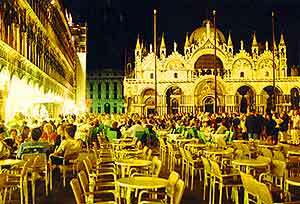 Venice's main piazza is the point around which Venice life revolves and there is always an exciting atmosphere in this busy square, with many cafés often playing live music. Without doubt one of the finest piazzas in Italy and the whole world, the Piazza San Marco (St. Mark's Square) is bordered on three sides by the arcades of public buildings, Venice's Procuratie Nuove (south), the Procuratie Vecchie (north) and the Ala Napoleonica (west). The stunning rounded domes of the nearby Basilica San Marco add to the overall character of Venice's Piazza San Marco (St. Mark's Square). Originally considerably smaller, with fruit trees and even a small canal running down the centre, Venice's Piazza San Marco (St. Mark's Square) was covered with paving slabs in 1267 and the canal subsequently filled in. Other attractions in Piazza San Marco (St. Mark's Square) include the 15th-century Torre dell'Orologio clock tower, which stands high above the entrance to the Mercerie and features a loud bell that is struck every hour. St. Mark's Square is actually one of the lowest areas in Venice and as a result can become quickly covered in water at high tide (acqua alta) during October to March, which is quite an unusual sight.